So now you’ve made the basic soap recipes and you want to add some color and fun to your soap. Adding Color to homemade soap is not difficult. It’s a matter of finding out what to put in. There are a lot of ideas on the internet that I would not recommend simply because of toxicity…a big thing! In my mind, why go to all the hard work of making soap if you’re going to ruin the whole batch by adding fragrance oils and dyes. When you make your own soap, you have a great opportunity to make something nourishing for your family. I’ve added hints below for adding color to homemade soap, as well as all kinds of wonderful natural colors to try. Activated Charcoal – adds black to grey or bluish color, depending on concentration. Some coarse brands add an element of exfoliation as well. Great for acne. Get some activated Charcoal Soap Here. Cinnamon – while cinnamon oil burns the skin, cinnamon powder adds a nice light brown color. Some people are sensitive to it though. Beet Root Powder – grey to brown color. It does not keep it’s beautiful pink color. A lot of colors are changed in coming in contact with lye. Coffee – use instant coffee to produce dark brown specs. It is exfoliating, but will not smell like coffee. Spirulina – This is a blue-green algae used as a supplement by people. You can buy the capsules and break them open to add to your soap. It makes a pretty green color. Chlorophyll– also adds a green color. Alfalfa – dried and ground. Burdock Leaf – infuse in oil. Comfrey Leaf – can be infused in oil or added at trace. Dandelion Leaf – Yes, right out of your yard! Dry, grind to powder and add at trace. Alkanet Powder – Some, including myself, believe alkanet powder to do wonders for acne and other skin issues. So it’s definitely a good option. It will make everything from a deep purple to a bluish purple. It needs to be steeped in oil before adding at trace. Black Walnut Hull – This is good to mix with the entire batch, giving it dark purple specs that are good at exfoliating as well. Red Sandalwood Powder – make a purple red color, depending on the ph level of the soap. Calendula Powder – calendula has a lot of great medicinal purposes, makes a pretty yellow, and can also be added as a flower instead of powder. The flower will give your soap yellow spots and streaks. Indigo Powder – creates a deep blue. Woad Powder – creates a lighter blue. Moroccan Red Clay – This makes a beautiful orange/red color and also draws out impurities of the skin. Madder Root Powder – add at trace, can be vibrant red or more muted pink depending on how much you add. Paprika – I like this best infused in oil and then the excess strained out. Makes a pretty orange color. As you can see, these colors are vibrant! Many change when you add them to soap, but make a new beautiful color so double check the chart before you think pretty beet root will make pink or something. 🙂 Arrow root powder is in the picture because this is also a picture I use for making Homemade Eye Shadow and Blush. Arrow root powder is used in soap making to help enhance a silky feel and slippery texture. Carmine or Cochineal for pink – this dye is considered natural, but has to go through a heavy processing to derive the finished product from the South American insect. Melted Crayons – crayons are made from “wax” – no they are made from paraffin (the sludge left over from making petroleum), and mystery pigments…not going on our skin! Mica – mica is often colored with who knows what to make it that pretty bright color. Unless you know what that mystery colorant is, don’t use it. I make our family’s soaps and have been wanting to add a little color to some to differentiate easier between the different types. Thanks for this post – it’s very helpful. visiting from A Little R & R link up this week – have a great day! I am considering using Spira Lina or turmeric but I’m concerned that the soap itself could stain the bathroom counter? Any comments about the stainable properties after the soap is made.? Spirulina and turmeric won’t stain at normal levels. If you used cups and cups worth I’m sure it would. I use 1/4 cup per 9 pound batch. That’s 1-1/4 teaspoons per pound of soap. That’s enough to give a beautiful color and never leaves stains. Also, FYI, spirulina and Turmeric fades greatly in soap unless infused in oil first. 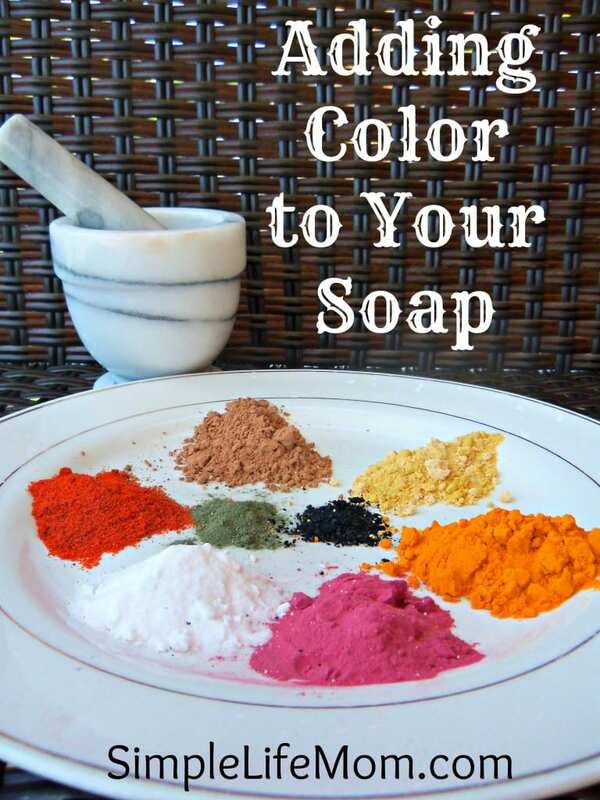 Thanks for sharing … These colors looks beautiful… these days unnatural ingredients in many commercial skincare products, have become so common… This idea of adding color in soap looks healthy as well. Few years ago I started making homemade soap for personal use but now I’m doing it for a living and what you have posted here is an additional knowledge on part to improve my business. Glad you have shared this. Hi there!! I am new to all of this and just starting out. For the Alkanet Powder, how do you “steep in oil”? Thanks for Sharing…. I have been searching the internet for colors… and so many sites make it confusing! They show that tbey afe pigment colors then when you start reading the infor on the color they are really mica colors. I have finally found some of the pigment colors that I have purchased and look forward to using them. I can’t help but wonder if this makes the soap smell like the spices and some of these spices seem like they might burn your skin or something. Is there not enough for this or do people not care about the smell? No. I wondered the same thing when I first started making soap. I actually wish it retained some of the scent, but alas it mostly gets killed off on the specification process. Cocoa is the only one I’ve used that does seem to keep a little scent, but towards cocoa butter for a cocoa scent to soaps, lotions, etc. As for skin sensitivity, there’s not enough to do so, though you can still reap the benefits of some herbs such as turmeric, cloves, etc. Cinnamon is one that you need to be careful of in essential oil form, but I’ve used a lot of powder in my oats and honey soap and its actually one of my most mild soaps. So do not fear, have fun with the colors, and use essential oils for scents. Using Indigo, I processed some fiber materials. I have previously used a liquid form but found the power to much more affordable. Woad is very expensive at $26 US dollars an oz. The Indigo does have an odd smell, one that is not pleasing, and I just added it to water, let it sit for a day. Do you have a suggestion on how to prep this produce for coloring soap? For the indigo, I add it like I do my charcoal, by scooping out a few large spoonfuls of soap into a small bowl when it is reaching light trace and mixing it with a whisk. I have also heard people say that they get a prettier blue by letting it steep in their liquid, warm oils. This makes a lot of sense. If it is already reconstituted in water, use this as some of your lye water. As you can see, there are a number of acceptable methods. I’m guessing the oil method would give you the brightest color, but I haven’t tried all of them as of yet. Thanks for posting this. But I was thinking, hat about oxides? Are those not considered natural? Are they bad for the skin? Yes, most oxides can be toxic to the body if they are nano sized (which many companies do for blending into cosmetics smoothly). So definitely look into the product before buying. They are found naturally in the ground. The form we use in sunscreens and as pigments in makeup and soaps are not. They are completely man produced so that there is no contamination from arsenic, lead, etc. That may sound good, but the chemicals they use to process pigments and oxides are extremely unhealthy. So, it’s important to use non-nano so that the particles are large enough that our pores cannot absorb it. You can’t find that unless you are using non-nano zinc oxide. Even then, some people will not use because of its processing. Hello! I am new to the soap making world and hope to use natural herbs I can grow to add color and depth to my soaps. I tried to grind lavender and basil into a powder using a nice coffee grinder- but found it only gave me very fine pieces of herbs- not smooth or powdery really. Any suggestions for achieving a smooth powder when using natural herbs from my garden in soap coloring/fragrances? Different herbs will grind differently. Basil can grind to a powder easier than lavender. Lavender flowers are beautiful kept whole though. Try a mortar and pestle. I use homemade herbs in infused oils used in the soaps, sprinkled on top while still soft, or mixed in. The small pieces are fine that way. If you want to go for coloring, buying it already in a fine powder may be the best bet if you can’t get the texture you want. Try steeping them in the oil on low heat for a while to infuse the oil. Very helpful info, Kelly, thanks! I love making soaps and have been using only natural herbs and infusions for colouring and essential oils. I share the same thoughts about everything you’ve written here I like very much your recipes for sunscreen, thank you! Thank you so much! That’s why I write! Have you ever used oregano in soap. I live in the south of Italy and it grows wild on our ground and is never treated with any chemical. I have not used dried oregano. I’m sure the leaves would end up being brown specks. Quite possibly if you could grind it to a fine powder it may add a uniform color, but I think it will be similar to basil in that it won’t survive saponification and will turn brown. Hi, Can I use these colorants with Melt & pour making? Yes you can. Add and mix well before pouring. Want to pre mix Titanium Oxide for soap making: Is there a special fluid or about to make this ahead of time? Lots of sites talk about making it up ahead of time no one says how much and what fluid. Help!! Some studies show titanium oxide to be carcinogenic. I do not use it. Just wondering if I could use these colorants for bath bombs. I think if I add it to the melted coconut oil I use that might just work. Your thoughts on this. You defintiely can. When making soap the colors are effected by the lye and heat, so these will actually be more true colors in bath bombs.? One way to make powder from your lavender or flowers is to dehydrate them in a dehydrator or oven. Then they can be put into a Ninja food processor (use the container to blend a shake drink in) to pulse them quickly into a powder. You can also pulse candy canes, dried orange peel, and much more with your Ninja processor. Great ideas Andrea. Thanks for sharing. Hi, sorry it took me a few days to get back to you. It’s been a crazy week. It sounds like you are hot prcoessing. The darker color is not from the stainless steel pot, and removing the lid when hot processing usually just leads to dry chunks stirred into the soap, not a darker color. Are you using a white palm oil or red? It could be because you are overheating your oils. Are you using potassium hydroxide instead of sodium hydroxide in order to create a liquid soap, or just adding more water after saponification? To make a hand soap more sudsy you can you can add more castor oil. I’m not sure how much you are using. Make sure you put all of your ingredients through a lye calculator like on soapcalc.net. Thank you for any advice that you can share. That’s a huge question. Starting local is a great way to start getting your logo ready and finding out what people like. Try selling to friends, boutiques, and in local craft shows. Etsy is a great online starter, but there’s a lot of soap competition. This list is very helpful, thank you! My son reacts to everything with rashes and bumps so we have started making our own soaps together. We also wanted to try making soaps to give to family and friends this year for Christmas gifts and were looking for ways to color them naturally. We saw alfalfa powder for sale as a colorant, and it grows everywhere on our farm so we dehydrated some ourselves to try it. Unfortunately, even though our soap started out nice and green, it has faded to a pale brown color while curing. So we are nervous about ordering expensive herbs and powders online and having them not work out. Is there a method for making sure the color doesn’t disappear? A lot of greens will do that. I’ve had the best luck with spirulina added to the lye water. Oil infusions (like with parsely or spirulina) tend to hold green longer as well, rather than just added at trace. Thank you for your article and information. I’ve been making CP soap now for about 8 months and use all natural ingredients including my colorants and have some of the ones you’ve listed above. My struggle is getting bolder colors. I know all natural will give mostly muted colors and I’m okay with that, I guess I’m curious to know how you add yours. Do you use both the infused water with lye and the infused oil at trace? And how much do you usually use? I would really appreciate your feedback. My coloring is the missing piece right now to my soap journey, lol. Thank you. These suggestions are ingredients I add directly at trace without infusing in oils. These are quick simple ideas. I go into depth in my book, The Natural Soapmaking Book for Beginners (http://bit.ly/NaturalSoapMaking). I have charts for infusing oils and how much, what’s best to add in lye water, etc. For bolder colors I like to use clays and oil infusions. Annatto will give bright yellows, paprika infusion will give deep oranges, rose clay can give bright reds added directly at trace. Greens are tricky. Most will fade. These look lovely! I’m wanting to add colour to epsom salts for a bathsalts mix, so you have given me some nice ideas. Any problem with staining? I know for instance that turmeric tends to stain fabric (bath towels). Has anyone noticed this? None of these stain when used in soaps, but bath salts may cause staining on white bath towels. They are just not incorporated and diluted as you would if making soap. Thanks for the article. Why do certain soaps discolor when left under the sun especially soap that is colored pink. Green is usually the color the people have the biggest problem with. Yes, herbal colors can fade over time, but most stay pretty strong. You can make an herbal oil infusion of color and sub that for some of the oil in your recipe. Sometimes oil infused colors last longer. Try clays. They don’t tend to fade either. I have a question about liquid Castile soap, please. I watched a video online on how to make liquid Castile soap thicken by adding salt solution. When I do this to a certain extent, like 12 tbsp per liter, I get a thick liquid like sauce, but it doesn’t thicken further. It doesn’t become a paste like the video. It separates into a clear liquid and foam on top. Why does this happen? Try one of the castile our Bastille recipes, or combine the lye water and oils at a cooler temperature than the 110 degrees. The higher olive oil amount creates a softer soap that takes longer to come to trace and the lower temp makes it slower to come to trace. Do one or the other. know where to start…….pls help! Thank you for this great resource, definitely bookmarking this! The natural indigo that looks green as a powder needs extra processing before it will turn blue in soap (It’s a fermentation process). There are brands that have already done that for you. Did you add it to the water first, then add the lye? It sounds like the lye scorched it, because you should at least have a pretty green color. I don’t think there’s any way to save that. You can use the same colorings as you would for cold process. For sensitive skin I would just advise to stay away from cinnamon. I also have to avoid grasses like lemongrass because of my grass allergy, so keep that in mind. Thank you so much for sharing these color alternatives. We don’t need to use toxic substances and it’s about time the majority actual know it! Thank you for saying that! I agree. There’s no reason why we can’t use natural, healthy ingredients. I want to make Huckleberry soap, but my scent is yellow, so when I add color, the color changes. How do I get purple if my scent is yellow? What do you mean that the scent is yellow? Abby here from all the way up in Canada, and I’m just wondering about mica? I know you said it was in the ‘don’t use’ category but I thought mica was just minerals? It would be greatly appreciated if your expertise can shed a little light on this matter for me, because I just ordered some and it’ll be here in a week? Great question. I grew up in Africa where we could dig mica out of our back yard. It varies in transluscent and light pretty hues. These colors are natural. The powdered micas bought in stores today have been dyed with synthetic dyes to make them super bright, which I do not use on my body for health reasons. Synthetic dyes have been shown to be unhealthy over and over again. I want to make a nice white soap that does not have lard, Palm or tallow in it. What blend of oils can I use to get white soap? Thank you!!!! The darker the oils, the darker the soap. Milks will also often darker soap. You can try babassu in place of coconut.